According to the state of epiphytic lichens, the preservation of forests and air quality is poor in the entire territory of the Republic of Slovenia, except in forests at higher altitude in the Alps and partially in the Dinaric mountain range. 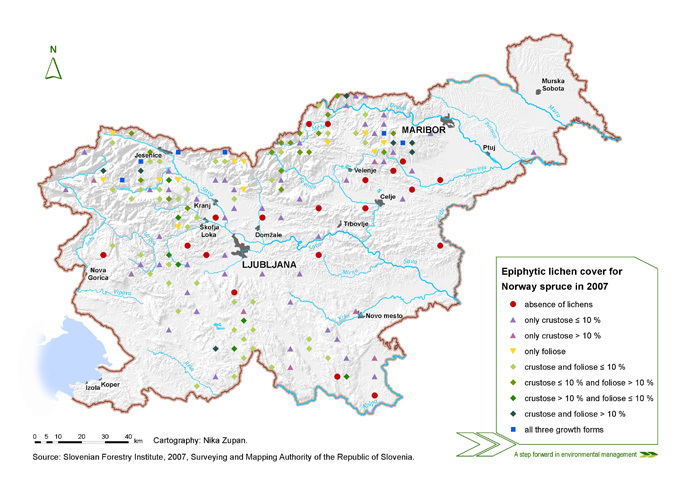 The indicator shows the cover and changes in the cover of epiphytic lichens for all tree species by categories, especially for common beech and Norway spruce. The category indicates the growth forms of lichen (crustose, foliose, fruticose). The data is based on the inventory of the state of forests from 2007. The monitoring of air pollution using epiphytic lichens is one of the oldest and most frequently used bioindication methods in the world used for such purposes. The cover of the three basic lichen growth forms (crustose, foliose, fruticose) reflects the state of the environment. The cover is measured during the regular inventories of the state of forests at network grid of 4 x 4 km. The representational value of cover of all three growth forms of epiphytic lichens on an individual point is calculated as a median cover of at least three trees of the same tree group. The knowledge of the lichen ecology enables simple mapping of epiphytic lichens as well as large-scale monitoring of the state of the environment on the basis of bioindication. Lichen are symbiotic organisms, their thallus is always compounded at least by the two partners - a fungus (mycobiont) and green alga or cyanobacteria (photobiont). Symbiosis is for fungus obligatory. Simple lichen body - thallus is not able to regulate its water content as do higher plants. Therefore lichens are active only when the thallus is soaked with water. Epiphytic lichens grow on woody plants, especially on truncs and twigs of trees and shrubs. In such circumstances they are very well adapted to absorb water and nutrients from the air, in the case of air pollution also air pollutants. Lichens are slowly growing thalophytes which accumulate harmful substances in longer periods than vascular plants. All theese traits and some additional (ratio in biomass between mycobiont and photobiont, mode of propagation,..) cause that lichens die earlier than vascular plants in polluted air. Sensibility of lichens to polluted air is related to the growth form of their thallus and also to the sensibility of the species of mycobionts and photobionts in the symbiosis in the particular lichen species. In this respect the presence of all three major growth forms of lichen thalli means better conditions for their thriving and also cleaner air, the absence of foliose and fructicose lichens means progressive air pollution. Complete absence of lichens, also the crustose ones means very polluted air. Apart from air pollution (extent of pollution and kind of pollutants) the thriving of epiphytic lichens depends also on properties of trees on which they grow (physical and chemical properties of the tree bark and types of tree crowns), age of trees, management with forests and climate factors. Indicator is based also on data related to cover of crustose, foliose and fructicose epiphytic lichens on chosen forests tree species gathered in forest inventory. Climatozonal tree species which are native in Slovenian forests were chosen, and among them data for Norway spruce and Common beech are presented, two the most spread forest stands forming tree species in Slovenia. It is important to stress, that the state of epiphytic lichens cover has been used as a differential indicator in assessing of air pollution impact on forest ecosystems. In urban environment, the choise of tree species in analysing of epiphytic lichens as bioindicator of air pollution would be different. Monitoring and reduction of negative influences of polluted air on forests. The vegetation of epiphytic lichens, estimated on the basis of median cover of crustose, foliose and fruticose lichens, reflects the state of forests with regard to the structure, age and integrity of forest ecosystems. The state of epiphytic lichen cover is also a result of the influences of sources of polluted air in the Republic of Slovenia, partially also of remote, transboundary air pollution sources. Therefore, the lichen cover categories as well as the cover of individual growth forms of epiphytic lichen thalli indicates a better preservation of forests and cleaner air in forests at higher altitude in the Alps (Julian Alps, Karavanke, Kamnik-Savinja Alps, the central part of Pohorje) and partially in the Dinaric mountain range. In central and eastern Slovenia, the vegetation of lichens is poorer due to local pollution sources (thermal power facilities, industry, transport, agriculture). 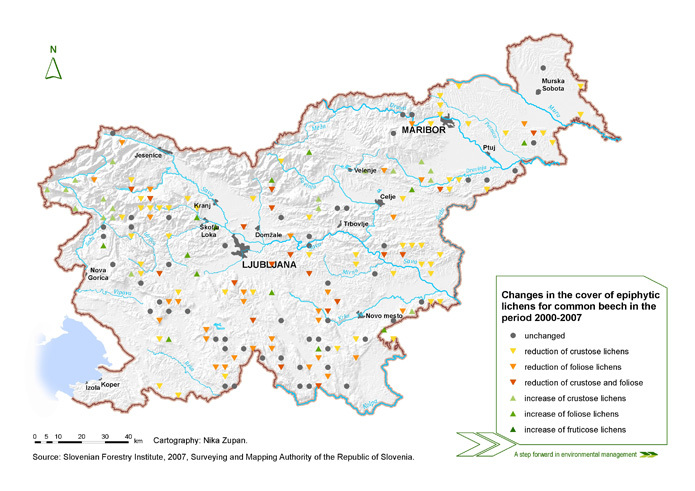 Poor vegetation in the western part of the Julian Alps and at higher altitude in the Dinaric mountain range is likely a result of remote, transboudary air pollutin. In general, the state of epiphytic lichen cover is relatively poor, which is indicated by the absence of fruticose lichens in the majority of the territory of the Republic of Slovenia and by the small cover of foliose lichens. This state may also be partially the result of the epiphytic lichen inventory method. All three growth forms of thalli and better cover is recorded only in mountain forests, which are distanced from the bigger air pollution sources and also have more favourable microclimatic and forest stand conditions for epiphytic lichens. Local deviations are a result of local climatic, forest stand and air pollution source conditions. The forest inventory from 2000 and 2007 indicates that the state of lichens in 2007 worsened. The state remained unchanged only in one third of plots, while in the majority of plots it worsened; the state improved only in a very small number of plots. The reasons for such a state could include the slow recovery of epiphytic lichen vegetation in forests after the reduction of air pollution by sulphur compounds, still high air pollution due to the increasing prevalence of transport, pollution from agriculture, some industrial activities and thermal power facilities, partially also the remote, transboundary sources of pollutants. In comparison with common beech, the deterioration is smaller and the improvement is higher with Norway spruce, which can be explained by the appearance of spruce forests at a higher altitude – at sites which are remote from local air pollution sources. Objectives summarised by: According to the ICP Forest programme, which is implemented within the framework of the Convention on Long Range Transboundary Air Pollution, CLRTAP. Methodology and frequency of data collection for the indicator: The method that was probationally used within the framework of the ICP-Forest is different than the method used by the Biotechnical Faculty for the needs of the data indication in this indicator, since it is based on the inventory of species. The method of inventory of lichens is a modification of the method that was developed by the Association of German Engineers (VDI 1995) for the inventory of the state of lichens as an indicator for the state of the environment; namely, it is adapted for the inventory of the epiphytic lichen vegetation cover on the basis of three main growth forms of thalli of epiphytic lichens and the assessment of their cover within the inventory grid is more accurate (Batič and Kastelec, 2007). The measurements of the epiphytic lichen cover of tree trunks are conducted all over Slovenia within the framework of the regular forest inventories plots in a regular inventory grid of 4 x 4 km. At each inventory plot, at least three trees of the same tree group are selected. The climatic-zonal, forest stand forming and of appropriate condition trees are chosen for the epiphytic lichen inventory. The epiphytic lichen vegetation of forest trees is the best on trees growing at their natural sites. In lowlands, the most appropriate are oaks, in the mountain zone are common beech and silver fir, and in the sub-alpine zone the Norway spruce and European larch. A small grid, a size of 250 cm2 with squares of 2 x 2 cm, is laid on the selected trees at a height of 1 m, to the tree trunk side which has the biggest epiphytic lichen cover. The cover and appearance of the tree basic growth forms of epiphytic lichens is assessed by the counting of the squares of the grid. The frequency of data collection is similar to the frequency of the forest inventory – every 5 to 10 years. Methodology of data consideration: On the basis of the assessments of the epiphytic lichen cover monitored on at least three trees of the same tree group, the median epiphytic lichen cover of tree trunks with lichens for an individual tree group is calculated for each basic growth form of epiphytic lichens. On the basis of the median cover of all three growth forms, the categories of epiphytic lichen cover of tree trunks are determined. Advantages – through epiphytic lichens we can also determine the air quality in areas where there is no appropriate infrastructure for physical-chemical measurements of pollutants. Data collection is relatively cheap and the method is simple and not hard to learn. The sensitivity of epiphytic lichens to polluted air is confirmed also by simultaneous measurements of pollutants and has already been tested in numerous countries. Besides the use of higher plants, the use of epiphytic lichens is an example of the biomonitoring of polluted air. Biomonitoring of the state of the environment is entirely implemented in Europe within the monitoring of the state of waters. For terrestrial ecosystems, these activities are only in the development stage. Disadvantages – the method is based on incidental selection of inventory plots and incidental selection of trees within them. In this case, the microclimatic conditions at the plot and the state of the forest stand can influence the epiphytic lichen vegetation more than the air pollution, since the searching for ideal trees for epiphytic lichen observation at the inventory plot is not permitted. Another weakness is the method of epiphytic lichens inventory. The cover of.growth froms of epiphytic lichens is assessed only within the grid of the 250 cm2 , which is placed with its lower edge on a tree trunk at a height of 1 m. Light conditions are frequently too weak for the good growth of epiphytic lichens in this forest layer; in cases of very old stands, these parts of tree trunks are already covered by epiphytic moss vegetation, which outcompetes the more heliophylic lichens. In the light of data collection, the method is accurate and repeatable. Problems may appear in the assessment of the cover of crustose thalli of lichens, especially in their identification and separation from epiphytic algae, some saprophytic fungi, and sometimes also due to the colour of the tree bark. Errors in data collection were eliminated through ignorance of thalli of crustose lichens similar to epiphytic algae (primarily an indicator of strongly polluted air, the Scoliciosporum chlorococcum species); in this way, we can at least partially avoid an error when monitoring air quality in highly polluted areas. In other countries, the biomonitoring of external air pollution using epiphytic lichens is conducted primarily by the mapping of species, whereby the method of determining the diversity and frequency of individual species is in the foreground; in our case, the assessment of the cover of three growth forms of epiphytic lichens is in the foreground. The mapping of lichen species has a larger range of values for the assessment of air quality on account of the abundance of species; however, our method partly compensates for this by a detailed assessment of the cover of growth forms of thalli. Epiphytic lichens are most frequently used as bio-indicators of the state of the environment and air in urban and open areas, for which some data is also available in the Republic of Slovenia. On the basis of the mapping of species in the area of Ljubljana and Maribor and on the basis of the indexes calculated on the basis of this mapping, we were able to compare the simple method, implemented within the framework of the inventory of forests, with the mapping of species and confirm the expected results. We found an improvement of the state of epiphytic lichens due to the reduction of air pollution by sulphur compounds, and an increase of nitrophilous species, which still points to strong air pollution by nitrogen compounds. There are not many studies that would determine air quality through the mapping of epiphytic lichens in forests; in this field, the most advanced studies were performed in Switzerland. These mappings were simultaneously accompanied by measurements of pollutants in the air. Some studies of this type were also conducted in Italy, Great Britain, the Netherlands, Estonia, Canada, in Scandinavia and elsewhere. In each case, the epiphytic lichens turned out to be good indicators of air quality. Therefore, a standardisation of the use of epiphytic lichens as such indicators is being conducted within the framework of the EU, including the participation of representatives from Slovenia. ARNDT, U., NOBEL, W. & B. SCHWEIZER, 1987. Bioindikatoren. Möglichkeiten, Grenzen und neue Erkenntnisse. Ulmer, p. 388. BATIČ, F. 1991. Bioindikacija onesnaženosti zraka z epifitskimi lišaji. Gozdarski vestnik 49: 248-254. BATIČ, F. / KRALJ, A. 1995. Bioindikacija onesnaženosti ozračja v gozdovih z epifitskimi lišaji. Zbornik gozdarstva in lesarstva 47: 5-56. BATIČ, F. / KRALJ, T. 1989. Bioinidkacija onesnžaenosti zraka z epifitsko lišajsko vegetacijo pri inventurah propadanja gozdov. Ljubljana, Zbornik gozdarstva in lesarstva 34: 51-70. BATIČ, F., MAYRHOFER, H., 1996. Bioindication of air pollution by epiphytic lichens in forest decline studies in Slovenia. Phyton (Horn, Austria), Special Issue: Bioindication, 36: 85-90. BATIČ, F. & KASTELEC, D., 2007. Popis epifitskih lišajev. In: KOVAČ, Marko, ed. Popis poškodovanosti gozdov in gozdnih ekosistemov : priročnik za terensko snemanje podatkov /Ljubljana : Slovenian Forestry Institute, p. 36-42. FERRY, B. W. / BADDELEY, M. S. / HAWKSWORTH, D. L. 1973. Air pollution and lichens. The Athlone Press, London, p. 389. HAWKSWORTH, D. L. & ROSE, F. 1976. Lichens as pollution monitors. London, Edward Arnold: 1-60. NIMIS, P. L., SCHEIDEGGER, C., WOLSELEY, P. (Eds. ), 2002. Monitoring with Lichens – Monitoring Lichens, Kluwer Academics, Dordrecht. STOFER, S. / KELLER, C. / FISCHER, R. / SCHEIDEGGER, C. Lichen monitoring within the EU/ICP Forests Biodiversity Test-Phase on Level II plots. VDI 3799, 1995. Measurement of Immission Effects. Measurement and Evaluation of Phytotoxic Effects of Ambient Air Pollutants (Immissions) with Lichens. Mapping of Lichens for Assessment of the Air Quality.